This is our store, LolyKat. It’s not much to look at right now, even though it is already better looking than a lot of the stores around here, but we will make improvements, bit by bit, as time goes by. Also in this picture you can see our still unfinished second floor (will do that when/if we get enough money), the BBQ area on your right and the upstairs portion of the Pepsi warehouse on your left. We have all the signs up for cell phones because Cathy also does loads for the cell phones. 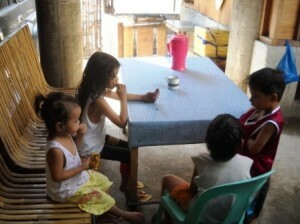 She still does not have the capability to do the Smart phone system yet, but can do Globe and TM. We have gotten into the habit of giving free coffee to the security guards at the hotel. Good for them, good for us and good for the hotel, everyone wins. 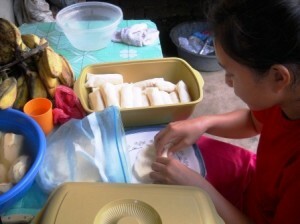 13 Jan 11 – Up and caring at 0747. Not much happening early on in the day. I didn’t even get to cook my pancakes until around 10:00. Lita was cooking rice on our burner so I had to wait. It’s cool though, no hurry. I had the pancakes made and eaten by 10:30. Lita and J left for the market around 0945. I asked her to stop at Mercury Drug to get me some Doritos, but that didn’t happen. I know she was only going to the market, but the drug store is not that far from the market, or she could have sent J to get them if she didn’t feel like it. Oh well, maybe next time. Tagalog Word of the Day: kanin (caw-nin) means rice. Why do they turn the clothes inside out to wash them here? Do all Filipino’s do that or is it just Vicky? All Lita will say is, “That’s the way they do it”. I mean the dirt is mostly on the outside, right? Is there some kind of strategy for this, that I have never heard or thought of? You may have noticed that I added a “Registration Form” on the blog. This is not necessary to continue reading just like you always have. In fact, it doesn’t affect you in any way whatsoever. It is there for me in case I actually do someday get someone that wants to inspect my blog for the purposes of adding advertisement to it. Of course it does me no good unless people actually do register. I guess it could hurt me also. I mean if the chance to register is there, and no one does, does that mean the blog is not worth it? Anyway…when/if you register, it will send a temporary password to your e-mail and you will be able to change it after you use the temporary one. It also gives you the opportunity to add additional information. The only things that are “required” are Nickname and E-mail. If that’s all you put in there, that’s cool. Please do not divulge any additional information if it make you feel uncomfortable. Now I know that some of y’all don’t like the idea of having to log in each time you want to visit the site. So for y’all, all I can say is “don’t”. Of course, at least for me, I have my password saved so I rarely have to retype it. I’m assuming that you can also register, but still access the blog without logging in. Registering shouldn’t affect accessing. Lita and I discussed today about what to do for my birthday on Tuesday. 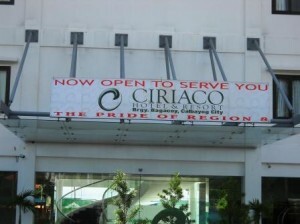 Since there is not much to do here and we can not really afford to go anywhere at the present time, I told her that I wanted to eat at the Ciriaco Hotel restaurant. She’s been wanting to do that anyway, so it’s a good possibility that we will be doing that on Tuesday or Wednesday (18th or 19th). After we go, if we go, I will let y’all know my opinion of the restaurant food. I know that the menu does not look that impressive to me, not for a hotel of the magnitude, but I always go on taste, not presentation, so the jury is still out for now. I was also wondering something else today. Yes I know that, my thing, is to write these posts, but I was wondering if it would be better if I wrote several short posts instead of one long one. I’m figuring that if I wrote only short ones, then you, as a reader, could pick out only the only that you are interested in and not have to read through anything that you think is boring. I’m sure I do write some things that y’all think is repetitive and probably just skim over until you get to the parts you want to read. For example, and without looking back, what time did I get up this morning? I put that on there almost everyday, but does anyone really care what time I got up? Do you just skim over it? I try to say it different each time, maybe you look forward to see how I can say, “I got up this morning”, in so many different ways. Let me know what you think about writing a series of short posts vs. one long one. Another thing, if the posts were short I could title similar posts close to the same and it would be like reading a continuing story. I don’t mind doing it either way really, I’m just trying to get the public opinion to make the blog the best that I possibly can. 14 Jan 11 – I’m starting to get frustrated with the blog again. Remember I did that not too long ago. I guess that that one day that I woke up and found out that there were over 2000 hits in one night, kind of spoiled me. I keep expecting it to do that again, but it doesn’t look like it ever will. Patience…yes I know, I need to have patience. This coming Wednesday, the 19th, it will only be 5 months since I started the blog. Most of the veteran bloggers that I have reviewed and talked to have said it takes at least a year to get going good. Although I was reading about a guy yesterday that just sold ‘another’ blog for $20,000. It wasn’t an advertisement either, he wasn’t trying to sell anything. In fact, he was explaining to us how he did it and what we should do. No mention of money every mentioned. He did reference his blog, but didn’t say we should go there, just a reference. I do that with my blog all the time. My problem is that I don’t really know much, well not even to do a blog that anyone would be interested in buying, I don’t think so anyway. I don’t really have a passion to write about anything that hasn’t been written about thousands of times already. Nothing except this blog, but I doubt anyone will want to buy this one. It has to be a blog that will make the buyer money, this one wouldn’t/couldn’t do that. I’ll keep thinking on it. Lita had to go to the market again today. Good sales yesterday. Since we’ve opened LolyKat Store, LolyKat BBQ has increased it’s sales. Makes sense. Might as well get something good to eat while we’re at the store. The market didn’t have any onions today. That’s a bit unusual, even for the Philippines. We are not out of onions, but it’s getting low and it seems that I eat at least 2 onions every day, either fried with eggs or mixed in a stew that I make. Speaking of stew, I made some beef flavored vegetable stew today. I’m getting pretty good at that, if I do say so myself (and I do). The water I put in to make the stew is just about the only water that I’ve been getting recently, because of the thing I wrote about in the last post, which I haven’t gotten any responses to yet, by the way. I didn’t cook too much in Texas, but here everyone is so busy, except me, so I help out in little ways the best I can. This time I did not eat the whole pot. I left a little to eat later, but I doubt very seriously I’ll be eating again today because I am so full. All those vegetables won’t stay in there long though. I walked down to another little store to purchase a 1 liter Coke, because, you know, I don’t really like Pepsi. Okay I said it. Titing, if you are reading this, I’m sorry, but Pepsi is just too sweet for me. Mountain Dew is great though and I even like the Sting energy drink, both flavors we have. To follow up on that stew thing, I did not eat again that day as I suspected, so I will have those leftovers tomorrow. (Since ‘tomorrow’ is really already today, I have to note that while I was typing that sentence, Lita was asking me about that leftover stew and if I was going to eat it…weird)? We had plenty of eaters today, hopefully they were very hungry. I try not to stare while they are eating because some of them get kind of embarrassed with that. Not that I’m staring, but because I’m a foreigner staring. Staring is rude anyway, so I just try to glance at it when I pass by. I only pay attention to the final results (the money) later. I’m learning more about Excel. I’ve already complied a worksheet for February for our store and it looks different, better I think, than the one for January. I didn’t mess with the January one too much because I don’t what to lose any data because I was careless. I’ll just improve the worksheet as I learn more about Excel. Think I’ll make the worksheets 1 month in advance every month. That way I’ll have a blank worksheet to tweak and can always scrape it and start over if I mess it up. The one for February not only looks better, but it utilizes the available space better and has a couple less transactions, but still ends up with the correct results. Useless Knowledge: On September 23, 1969, the tabloid The Northern Star printed the first of many rumors that Beatles singer Paul McCartney was dead. Its first shocking headline read “Clues Hint at Beatles Death,” which created an outbreak of speculative and near-hysterical opinions, most of which were pulled from interpretations of Beatles album covers and song lyrics. Teenage girls all over the world were in a frenzy for months. (I remember that, but I wasn’t that concerned and no one in my family went into a panic, of course my sisters were only 7, 8 and 10 years old at the time). Gloria Macapagal-Arroyo, completed the remaining term of Estrada and ran for re-election against Fernando Poe, Jr., another popular actor and a friend of Estrada in May 2004. Arroyo with her running mate Noli de Castro was eventually proclaimed the winners of the Presidential & Vice-Presidential elections. She has been advocating a change from a Presidential form of government to a Parliamentary form of government. Arroyo’s husband & son has been rumored to be receiving money from gambling lords and this has tainted her reputation. A tape recording of Arroyo talking with a commissioner on elections surfaced establishing impropriety by Arroyo and suggesting that she might have influenced the outcome of the last elections. Demonstrations followed in June 2005 calling for Arroyo to resign. On the eve of the anniversary of the “People Power Revolution” on February 24, 2006, the government took pre-emptive measures to quash alleged plots to unseat Arroyo through massive rallies and a coup. Arroyo declared a “State of Emergency” the next day mobilizing the police and the military averting any destabilization moves. May 14, 2007 – National Elections for Senators, Congressmen, Governors, Mayors and local officials. Although there are instances of violence and allegations of cheating specially in Mindanao, this elections is considered by many as one of the most peaceful elections conducted in Philippines. September 12, 2007 – Former President Joseph Ejercito Estrada is convicted of plunder by the Sandiganbayan, the anti-graft court and is sentenced to 40 years imprisonment. He is the first former president ever convicted of any crime in Philippine history. Six weeks later, on October 26, Estrada was pardoned by President Arroyo. Benigno Simeon Cojuangco Aquino III, affectionately called “Noynoy”, the son of former President Corazon C. Aquino and the late Senator Benigno Aquino, won the May 10, 2010 presidential elections. He was proclaimed president on June 30, 2010 at Rizal Park in Manila. Former President Gloria Arroyo, was elected congresswoman for the second district of Pampanga. This was the first computerized national elections in Philippine history. Hi JJ! I’ll have to start making notes when I come across something you’ve written about which I felt commenting, but I’d wait to get to the end and by that time I may have to take off or I get interrupted and don’t get back to it again. LolyKat’s lookin’ luvly. 🙂 Take snaps of it from time to time so we can watch the progression, ha? I thought I’d add that “ha?” to give this a local flavor. 🙂 🙂 Do the Samarenos add that to some of their sentences, too? The visayans do. It takes the place of “ok?” as in, “Do this for us, ok?” As the Waray speakers say, “Agidaw, kaupay nim!” Which leads me to ask, aside from English (you and Lita) what is spoken around you, waray or Visaya/Cebuano? 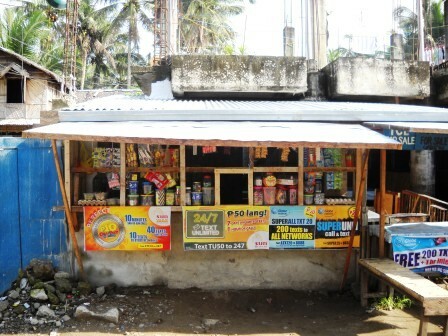 I’m sure your customers must speak waray; I meants in your compound. Yes make notes. I like as many comments as possible. I don’t mind responding. Gives me something to do beside getting beat by Zuma Deluxe Level 9 (especially Level 9-3). I’ll be sure to take pictures now and then of LolyKat. I’m hoping it will blossom soon. Looking pretty decent so far. It has even increased the BBQ business a bit. Yes they use that “ha” at the end of a lot of sentences. I don’t know what language they use mostly around here, because I dont’ know what the heck they are saying. It’s probably Tagalog because Lita does not know Waray very well. Visayan would probably be the #2 around here because most everyone here was born and/or raised around the St. Bernard/Tambis area. I am getting pretty good at cooking that stew. I may be the only one eating it though. No one else wants to try it, just like I don’t want to try their food. The “mini pow wow” picture I did on a whim. I had the camera and they were at the table talking. 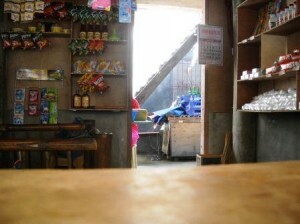 I thought of the name for the photo as I was inserting it in the blog. I think the biggest problem they solved was who gets what toy or maybe who is the biggest pooh pooh head. I don’t know, they didn’t say. Well I’ll be making stew later today also. Stop by, I’ll let you have a bow. I love the hot spice. And I’ll be making some more this afternoon. Just had 2 PB, J & B sandwiches. That’s peanut butter, jelly and banana. JOHN… THIS IS UR BLOG. YOU CAN DO IT ANY WAY U FEEL COMFORTABLE WITH. LONG OR SHORT, I AM SURE PEOPLE WILL STILL READ IF IT IS INTERESTING ENOUGH. YOUR BLOG IS YOUR WAY OF EXPRESSING YOUR LIFE WHILE YOU ARE LIVING THERE. THIS IS WHAT KEEPS YOU GOING EVERY DAY. WHO CARES IF IT IS WORTH ANY MONEY OR NOT? IT GIVES YOU SOMETHING TO LOOK FORWARD TO EVERY DAY. TO ME, (WHEN I DO READ IT) WHAT YOU DO EVERY DAY IS INTERESTING. I DON’T CARE IF YOU TELL ME WHAT TIME YOU GET UP OR WHAT YOU HAD FOR DINNER. IT’S FINE. AS LONG AS YOU ARE HAPPY WITH WHAT YOU ARE DOING, THEN JUST KEEP GOING. YOU NEVER KNOW WHAT COULD COME OF YOUR BLOG :). AND JUST SO YOU KNOW, I TRY TO READ AS MUCH AS I CAN OF YOUR BLOG. JUST THAT I WORK DIFFERENT HOURS AND JUST DONT GET AROUND TO READING EVERY ONE OF THEM. I DO READ THEM, BUT ONLY COMMENT ON THE ONES THAT INTEREST ME.. Very nice comment Wanda. (except you didn’t have to yell). Yes in my blog I do express myself quite a bit and y’all know ‘almost’ everything that goes on around here. I kind of care if it makes money, because right now, since we had to buy a new vehicle, new appliances and build the store, we are living month to month. Of course after the truck is paid and the bill for the appliances is paid, we’ll really be doing pretty good. I’d like for us to get to that point faster and have enough money to come visit Texas more often. I’m glad you read as often as you can. Just think, before you wasn’t reading it at all, now you like it. Maybe I should give Precious another ice candy to thank her because I know the main reason you even looked at the blog to begin with was to see what she looked like, since Joyce thought she was so cute. You know that Jaclyn wants to introduce Wyatt to her. I wonder how that would work out? So IF they show up and IF they bring Wyatt, I’ll let y’all know. I totally agree with your points. There must be something to the “birds of a feather..” saying. Even our names have only one different letter. LOL! hi winda.. this is wanda. i guess i sort of take after my big brother..lol. very special to me in more ways than one. just wish he didnt live so far away, but i guess that will make it more special when he does get to come home. so, what do you do and where do you live? how do you know john? and ok, if you are trying to make money from your blog, then good luck! hope it works out ok for you. Well I was thinking about it after I went to bed and I have seen that most other blogs seem to be a series of short posts. what I am doing already.